آدرسی, مصطفی, احمدی, امین, احمدی, محسن, فرصت, مسعود, تقی پور, محمد. (1396). رفتار شناسی خرابی و تعیین وزن ناشی از بارگذاری ترافیک با استفاده از خاصیت خودتشخیصی در حسگرهای بتنی. فصلنامه علمی - پژوهشی مهندسی حمل و نقل, 9(2), 139-154. مصطفی آدرسی; امین احمدی; محسن احمدی; مسعود فرصت; محمد تقی پور. "رفتار شناسی خرابی و تعیین وزن ناشی از بارگذاری ترافیک با استفاده از خاصیت خودتشخیصی در حسگرهای بتنی". فصلنامه علمی - پژوهشی مهندسی حمل و نقل, 9, 2, 1396, 139-154. آدرسی, مصطفی, احمدی, امین, احمدی, محسن, فرصت, مسعود, تقی پور, محمد. (1396). 'رفتار شناسی خرابی و تعیین وزن ناشی از بارگذاری ترافیک با استفاده از خاصیت خودتشخیصی در حسگرهای بتنی', فصلنامه علمی - پژوهشی مهندسی حمل و نقل, 9(2), pp. 139-154. آدرسی, مصطفی, احمدی, امین, احمدی, محسن, فرصت, مسعود, تقی پور, محمد. رفتار شناسی خرابی و تعیین وزن ناشی از بارگذاری ترافیک با استفاده از خاصیت خودتشخیصی در حسگرهای بتنی. فصلنامه علمی - پژوهشی مهندسی حمل و نقل, 1396; 9(2): 139-154. استفاده از حسگرهای باقابلیت خود تشخیصی که علاوه بر تعیین میزان نیروی وارده، عملکرد دیگری مانند تشخیص روند رشد خرابی را در جسم روسازی بتنی بر عهده بگیرند، در حال حاضر توسعه زیادی یافته است و بخش مهمی از سیستم پایش جسم روسازی راه است. 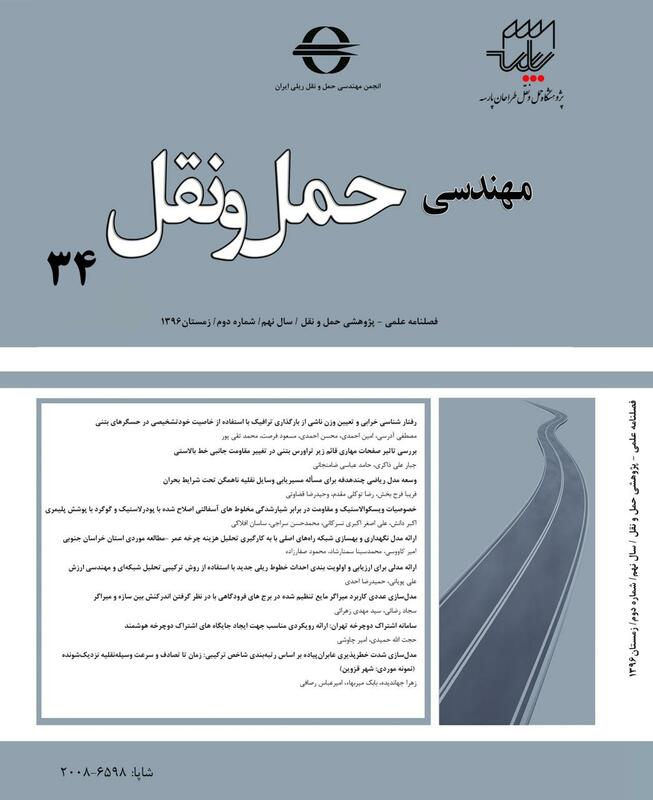 در این تحقیق امکان استفاده از حسگرهای سنجش خرابی به‌عنوان حسگرهای تعیین بار خودرو در روسازی به‌طور هم‌زمان بررسی خواهد شد. با استفاده از این حسگرها علاوه بر اینکه سطح سلامت سازه و گسترش ترک در آن‌ها به‌مرورزمان تحت بررسی قرار می­گیرد، می­توان از آن‌ها به‌عنوان حسگرهای تعیین بار و شمارشگر خودرو نیز استفاده نمود. بنابراین اهمیت این تحقیق در توسعه زیرساخت هوشمندی است که قادر است سلامت خود را بطور پیوسته نشان دهد که این خاصیت در مدیریت و تعمیر و نگهداری روسازی نقش بسیار مهمی را بر عهده دارد و همچنین با تعیین وزن و تعداد ترافیک عبوری بر روی روسازی، این حسگر می­تواند جانشین مناسبی برای حسگرهای موجود باشد. به‌منظور شبیه‌سازی شرایط وجود حسگر در جسم روسازی، یک حسگر بتنی کوچک ساخته شد و در میان یک تیر بتنی به‌عنوان یک المان از محیط روسازی جای‌داده شد. به‌منظور فرمول‌بندی رفتار تشخیص بار ترافیک در جسم روسازی، تیر بتنی تحت بارگذاری دینامیکی با شدت مختلف قرار گرفت. نتایج نشان داد که حداکثر بار خارجی وارده به حسگر (Fmax) با حداکثر پاسخ حسگر(Smax) به نسبت شیب منحنی نیرو- زمان(tgα)به شیب منحنی پاسخ حسگر- زمان (tgβ) وابسته است. همچنین در ادامه به‌منظور ارزیابی رفتار تشخیص خرابی توسط حسگر بتنی، بارگذاری به‌صورت استاتیک به تیر بتنی وارد شد تا درنهایت تیر بتنی حاوی حسگر بتنی بشکند. نتایج نشان داد نقطه شکست، روند گسترش خرابی و درنهایت مرحله جداشدگی کامل نمونه به‌وضوح توسط حسگر تفکیک‌شده است. بنابراین می­توان نتیجه گرفت که استفاده هم‌زمان از حسگر سنجش خرابی برای ارزیابی رشد خرابی و همچنین تشخیص بار وارده به روسازی به‌عنوان یک حسگر فشارسنج، امکان‌پذیر بوده و قابلیت فرمول‌بندی آن با دقت بالا (99/0R2adj.>) وجود دارد. -AASHTO. )1993) "AASHTO guide for design of pavement structures", Washangton D.C.: American Association of State Highway and Transportation Officials. -Adresi, Mostafa, Hassani, A. Javadian, S. and Tulliani, J. (2016) “Determining the Surfactant consistent with concrete in order to achieve the maximum possible dispersion of multiwalled carbon nanotubes in keeping the plain concrete properties”, Journal of Nanotechnology, Vol. 2016, pp. 1–10. -Adresi, Mostafa, Hassani, A., Tulliani, J., Lacidogna, G. and Antonaci, P. (2016) “A Study on the main factors affecting the performance of self-sensing concrete”, Advances in Cement Research , Vol. 29, Issue 5, pp. 1-14. -ASTM:C192/C192M-13. )2013. “Standard practice for making and curing concrete test specimens in the laboratory”, ASTM International 4: pp. 1–8. -ASTM C78. )2012) “Standard test method for flexural strength of concrete (Using simple beam with center-point loading).” ASTM International, West Conshohocken, PA, pp. 12–14. -Azhari, Faezeh and Nemkumar, Banthia )2012) “Cement-based sensors with carbon fibers and carbon nanotubes for piezoresistive sensing”, Cement and Concrete Composites Vol. 34 , No. 7, Elsevier Ltd: pp. 866–873. -Azhari, Faezeh, and Nemkumar, Banthia )2015( “A 3D percolation model for conductive fibrous composites: application in cement-based sensors”, Journal of Materials Science Vol. 50, No. 17, Springer US: pp. 5817–5821. -Baeza, Francisco Javier, Galao, O., Zornoza, E. and Garcés, P. )2013( “multifunctional cement composites strain and damage sensors applied on reinforced concrete (RC) Structural Elements”, Materials, Vol. 6 No. 3, pp. 841–855. -Bontea, Dragos-Marian, Chung, D. D. L. and Lee, G. C. )2000. “Damage in carbon fiber-reinforced concrete, monitored by electrical resistance measurement”, Cement and Concrete Research Vol. 30, No. 4, pp. 651–659. -Chiarello, Manuela, and Zinno, Raffaele )2005) “Electrical conductivity of self-monitoring CFRC”, Cement and Concrete Composites Vol. 27, No. 4, pp. 463–469. -Du, Hongjian, Quek, Ser Tong and Dai Pang, Sze (2013) “Smart multifunctional cement mortar containing graphite nanoplatelet”, Sensors and Smart Structures Technologies for Civil, Mechanical, and Aerospace Systems, No. 8692 , pp. 1–10. -Galao, O., Baeza, F.J., Zornoza, E. and Garcés, P. )2014) “Strain and damage sensing properties on multifunctional cement composites with CNF admixture”, Cement and Concrete Composites, No. 46. pp. 90–98. -Gao, Di, Sturm, Mariel and Mo, Y L. )2011( “Electrical resistance of carbon-nanofiber concrete”, Smart Materials and Structures, Vol. 20, No. 4, pp. 49501. -Gopalakrishnan, Kasthurirangan, Taylor, Peter, Birgisson, Bjorn and and Attoh-Okine, Nii O. (Eds.) )2011( "Nanotechnology in civil infrastructure a paradigm shift", Springer-Verlag Berlin Heidelberg. -Han, Baoguo, Ding, Siqi and Yu, Xun ) 2015( “Intrinsic self-sensing concrete and structures: a review”, Measurement No. 59. pp. 110–128. -Han, Baoguo and Ou, Jinping )2007( “Embedded piezoresistive cement-based stress/strain sensor”, Sensors and Actuators, A: Physical, Vol. 138, No. 2, pp. 294–298. -Han, Baoguo, Sun, Shengwei, Siqi Ding, Liqing Zhang, Xun Yu and Jinping Ou )2015) “Review of nanocarbon-engineered multifunctional cementitious composites”, Composites Part A: Applied Science and Manufacturing Vol. 70, pp. 69–81. -Han, Baoguo, Yu, Xun and Kwon, Eil )2009. “A Self-sensing carbon nanotube/cement composite for traffic monitoring” , Nanotechnology Vol. 20, No. 44, pp. 445-501. -Han, Baoguo, Yu, Xun and Ou, Jinping )2014) “Chapter 5 - Sensing properties of self-sensing concrete”, In Self-Sensing Concrete in Smart Structures, pp. 95–162. -Han, Baoguo, Zhang, Kun, Yu, Xun , Kwon, Eil and Ou, Jinping )2012( “Electrical characteristics and pressure-sensitive response measurements of carboxyl MWNT/cement composites”, Cement and Concrete Composites, Vol. 34, No. 6, pp. 794–800. -Kim, H. K., Park, I. S. and Lee, H. K. )2014( “Improved piezoresistive sensitivity and stability of cnt/cement mortar composites with low water-binder ratio”, Composite Structures, No. 116, pp. 713–719. -Konsta-Gdoutos, Maria, S. and Chrysoula, Aza )2014( “Self sensing carbon nanotube (cnt) and nanofiber (cnf) cementitious composites for real time damage assessment in smart structures”, Cement and Concrete Composites, Vol. 53. pp. 162–169. -Li, Chunyu and Chou, Tsu-Wei )2008) “Modeling of damage sensing in fiber composites using carbon nanotube networks”, Composites Science and Technology, Vol. 68, No. 15–16, pp. 3373–3379. -Saafi, Mohamed )2009( “Wireless and embedded carbon nanotube networks for damage detection in concrete structures”, Nanotechnology Vol. 20 , No. 39, pp. 395502. -Schulte, K. and Baron, Ch. )1989) “Load and failure analyses of CFRP laminates by means of electrical resistivity measurements”, Composites Science and Technology , Vol. 36, No. 1, pp. 63-76. -Shi, Zeng Qiang and Chung, D. D. L. )1999( “Carbon fiber-reinforced concrete for traffic monitoring and weighing in motion", Cement and Concrete Research , Vol. 29, No. 3, pp. 435–439. -Sun, Ming-qing, Liew, Richard J.Y., Zhang, Min-Hong and Li, Wei )2014) “Development of cement-based strain sensor for health monitoring of ultra high strength concrete”, Construction and Building Materials, Vol. 65, pp. 630–637. -Sun, Shengwei, Yu, Xun and Han, Baoguo )2014( “Sensing mechanism of self-monitoring CNT cementitious composite”, Journal of Testing and Evaluation, Vol. 42, No. 1, pp. 20120302. -Veedu, Vmod P-. (2010) “Multifunctional cementitious nanocomposite material and methods of making the same”, Cement and Concrete Research, Vol. 26, pp. 529-543. -Wen, Sihai and Chung, D. D L (2006) “Self-sensing of flexural damage and strain in carbon fiber reinforced cement and effect of embedded steel reinforcing bars”, Carbon, Vol. 44, No. 8, pp. 1496–1502. -Wilson, Jon (2005) " Sensor technology handbook", Elsevier. -Xiao, Huigang, Li, Hui and Ou, Jinping (2010) “Modeling of piezoresistivity of carbon black filled cement-based composites under multi-axial strain”, Sensors and Actuators A: Physical, Vol. 160, No.1–2, pp. 87–93. - Xiao, Huigang, Li, Hui and Ou, Jinping (2011) “Strain sensing properties of cement-based sensors embedded at various stress zones in a bending concrete beam”, Sensors and Actuators, A: Physical, Vol. 167, No. 2, Elsevier B.V.: pp. 581–587. -Yoder, E. J. and Witczak, ‎M. W. (1975) "Principles of pavement design", second edition, John Wily and Sons. -Yu, Xun and Kwon, Eil (2012) "Carbon nanotube based self-sensing concrete for pavement structural health monitoring", Center for Transportation Studies, University of Minnesota. -Yu, Xun, and Kwon, Eil (2009). “A carbon nanotube/cement composite with Piezoresistive properties”, Smart Materials and Structures , Vol. 18, No. 5, pp. 55010. -Zhang, Jinrui, Lu, Youyuan, Lu, Zeyu, Liu, Chao, Sun, Guoxing and Li, Zongjin (2015) “A new smart traffic monitoring method using embedded cement-based Piezoelectric sensors”, Smart Materials and Structures Vol. 24, No. 2, pp. 25023.